Rakhi, are you trying to give Radhe Maa a tough competition? 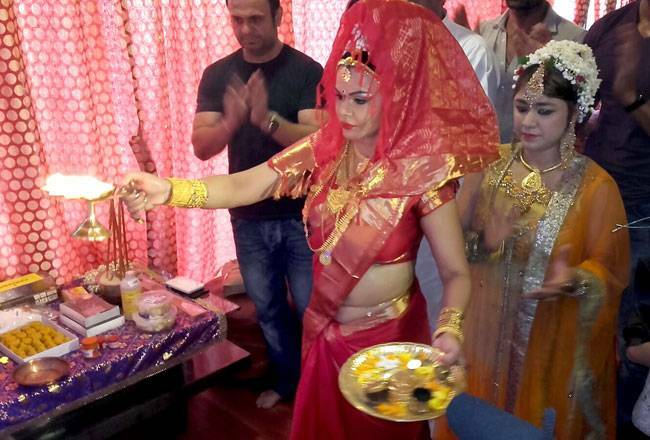 Looks like Rakhi Sawant has changed her loyalties from her beloved ‘Jejus’ to Ganpati Bappa! This starlet is in the new again and this time you won’t know whether to be aghast or laugh at her ridiculous antics. The starlet performed a song and dance routine at her residence yesterday on the occasion of Ganesh Chaturthi. Dressed in a glitzy red and golden saree (which is oh-so-familiar!) and an elongated, flowery headgear – Rakhi had surely dressed to kill (and literally so). These bizarre pictures will surely leave you in splits! This just proves that this weirdo will do just about anything to grab headlines. These are the funniest pictures you will see today, we guarantee. But one thing is clear, Rakhi Maa sure has some killer moves. She is all set to play Indrani Mukherjea on screen in film “Ek Kahani Julie Ki”.